Perhaps I missed the relevant posts (and the search function is useless for 3 letter words like "mai"), but I just noticed the banner for mai-guitar.com as a Jemsite vendor. Has this been around awhile? I'm curious if anyone has dealt with them. No current projects planned, but I'm always interested in knowing who's available and what kind of work they do. As we all know, most of the luthiers that showed up here to great fanfare in the past subsequently had spectacular crash-and-burns. Here is a free bump. I was also wondering the same, and am very curious. I also thought someone hacked the website and inserted that banner.. The banner is supposed to rotate to every paid sponsor. It's, broken. Likewise. I'm also curious about mai-guitar and the seeming "come out of nowhere" approach they've taken. I wonder if this lack of interaction means they'll get any business at all? The "example swirls" on the webpage look strikingly like some I've seen on eBay recently. I'm not impressed. Thats because they ARE lol. Hi guys. I'm Chris from Mai-Guitar (pronounced My-guitar). I started a website and ran an add with Alan. He said the regular adds were all filled, but he had a rotating banner. So far there are only a couple that rotate, but I think there will be more. As far as the not impressive swirls, to each his own. My helper and I started doing them in December 2010. For every one that has gone out on an auction, we have done at least 2 made to order. We started out trying to match others, but have now dialed into the unique looking schemes. Buy what you like. I'm not a big website guy. My host was supposed to provide some tools, but so far those are lacking. It has the main stuff though. I purchased the CNC programs and equipment from another builder in January. I have made some updates to the programming that improved the claw, made the pickup cover routes a bit bigger so you don't need to sand down your RG/JEM covers, and tweaked some other stuff. I do bang out some basic models. The concept of the website was to make just what you want, but charge a bit more for the mods. The “you draw it draw, we cut is” service offers a unique chance to trace out whatever you can think of, then we'll cut it. I have templates showing the places that need to stay to accommodate the routing. For the price, it’s a cool service. The other thing I have is access to some really cool woods. I have a batch of Alder that is super light - just over 3 lbs for a cut JEM style body. The idea on the JEM was Basswood for light weight, but Adder for sound. I think this Alder is lighter than factory Basswood, so its turn key. I have some Aspen that I’m looking for someone to review as far as tone. If someone is interested, shoot me a message. I’ll either send a body as a loaner, or sell one at a discount to test. My wood guys says it “should” sound like Alder, but be even lighter. I can get tons of it, so if its good, I’d like to know. So far I only have a few until I get some feedback. I have some old basswood that is super light too - like 2.5 lbs. I’m saving that for special orders. So that’s it for now. This isn’t my day job or anything. I’m having fun and have had a ton of interest so far. The clear coat makes the swirl in my opinion. Your swirls are average as far as vendor product goes, certainly better then the average garage worker. Your prices are more then fair as well. So, get one of your better swirls, clear it, and showcase that. That would be better to show. People dont realize how crappy swirls look until they are cleared and buffed lol. Thanks Alan. I'll take a few shots of the bodies that get cleared. Most of my completed guitars are bodies I bought from Nate. Ill show those for how glossy I can get the finish, but not so much as examples of swirls. Here is one that never made it to auction. I think this pretty sweet and will do one like this for my own stash. try not to paint the neck pockets. Lot of people are nitpicky about that. 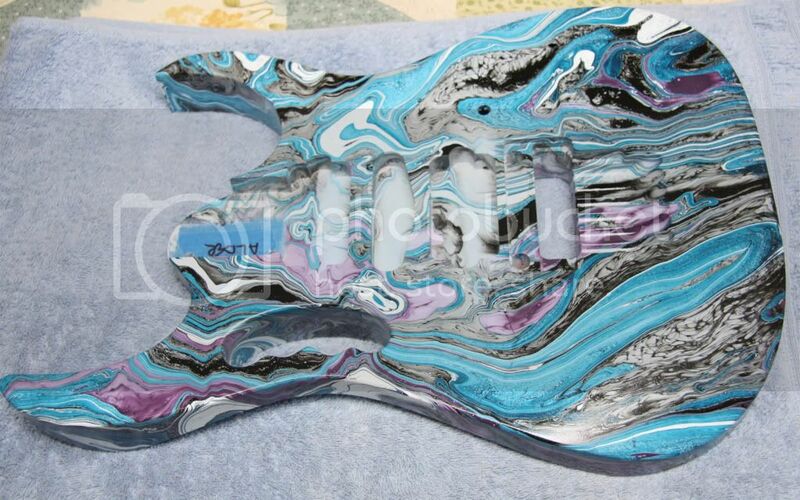 I just ordered a Jem body from Mai-Guitars--will post a thorough review upon arrival. This is going to be on the Purple Floral Jem project. Its hard to believe that body made it from Michigan to Alaska already. It looks like they didn't leave it though. I'll keep my fingers crossed on the review.